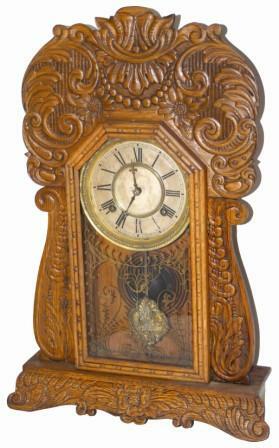 Waterbury Clock Co. oak kitchen clock, "Belden", ca 1903. This clock is about as original and as nice as any oak kitchen clock you will find. The 22" high case is clean, but has not been cleaned; it is complete and all original. The only shortfall is some paper loss of the two labels on the back. The glass, pendulum, signed dial, hands, gong, and the 8 day movement, are all nice and original to this case. LyWaterbury No. 1676.